Genius announced the G-Pen F610, an ultra-slim graphics tablet with a 6" x 10" contact area. The MSRP is $99. 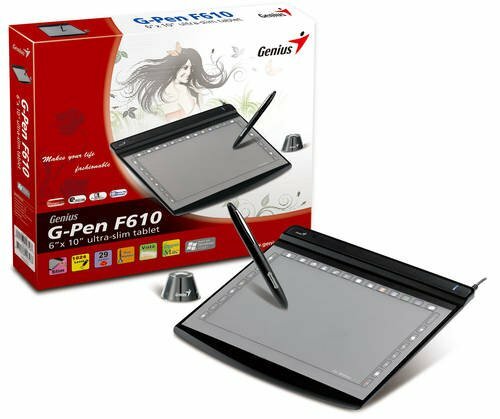 After its successful debut of the first G-Pen F610 Writing Graphic Tablet, the leading manufacturer of computer peripherals Genius launches an upgraded version with the latest software & package for Windows 7, expected to create yet another heat wave in the market. As an ultra-slim, 6” x 10” wireless text graphic-design tablet, the Genius G-Pen F610 offers better control than a conventional mouse and a stylish, slim design. The tablet pairs perfectly with either a Mac or PC computer, offering a functional as well as aesthetic tool for taking notes, handling emails (including handwritten emails), handwriting recognition, and professional graphics design. Genius' G-Pen F610 Tablet makes work more efficient with its 29 programmable “Hot-Key” areas to set up shortcuts for word processing, Internet and operating system tasks. Simply plug the unit into your computer and enjoy built-in, Vista-like functions, such as pen flick navigation. The G-Pen F610 Writing Graphic Tablet works with any screen size, and is perfect for flat and wide screens. The smart-looking pen packaging along with the Genius G-Pen F610 boasts two buttons and 1024-level pressure sensitivity, allowing graphic artists the subtlety of more pressure levels. The two pen buttons can be programmed to function as left- and right-click mouse buttons. Since the pen battery can last up to one year, the odds of a “power outage” during important work projects are highly unlikely. The pen also comes with a holder that protects the device and its tip, and keeps it handy for use.